Actors David Alan Anderson and Dalyn Stewart. Photo by Amber Mills. 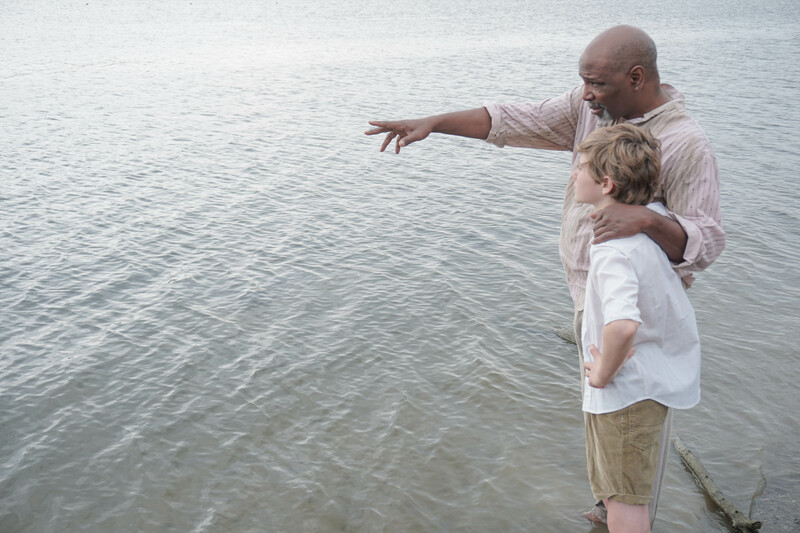 Amid a war-torn 1942, a young white boy and an older black man find themselves stranded on a Caribbean island in the Indiana Repertory Theatre’s (IRT) The Cay, on the Upperstage from January 28 through February 26. In this story of opposites, The Cay follows a friendship that blossoms despite racial division as Phillip (played by Dalyn Stewart) and Timothy (played by David Alan Anderson) learn that without each other, neither will survive. Together, the duo brings Theodore Taylor’s award-winning novel to life and share that despite age, upbringing or race, friendship can be found in the most unlikely of places. Taking place on a set that brings to life a variety of circumstances and locations, the characters survive being stranded at sea, tossed amidst a hurricane and deserted on an island. Geoffrey Ehrendreich, IRT Properties Manager, believes thecomplexity and creativity of the set to be the best work of the season. “My favorite theatre is when you have to use your imagination, and this production encourages just that,” said director and IRT dramaturg, Richard J Roberts, revealing that the sound effects have been created using musical instruments and theprops, including two giant palm trees, have been fashioned from items one might find washed ashore after a shipwreck. “This production asks the audience to look beyond the surface reality of stage objects and imagine a world of natural wonders, just as the characters must look beyond their personal differences and see the possibilities of friendship,” said Roberts. Celebrate the New Year, with new friendships found only in the IRT’s The Cay. Learn more about this production by visiting irtlive.com.